After what feels like eon's ago since we last had a public version of skyline that was able to be purchased. We have exciting new news. Skyline is back and better than ever before! With all new features and all new rendering parts, you can restart your skyline journey and jump in where you left of from Gen1. Its tooks some time to create Gen2 over the past 2 years and its work now shows for itself. Not only does skyline look and run better, it's also way more stable even on the Lite version. It's not like Gen1 where it crashed every 5 minutes.. Now you can do a full day's work without potentially hitting a bug. We would also like to thank all of our Gen2 Private alpha testers for their support and rigourous testing of the product over the past few couple of years. If not for them, skyline wouldn't be half the product it is today! So here's to marking history for skyline and getting rid of the Beta tag once and for all and reaching v1.0! HooRay!! New: DX11 & GL Shader Cache: Skyline will now append any shaders that have been generated to the shader cache file which should speed up loading times and operation of skyline in general since it won't have to generate a new shader for each different set of circumstances. Now it will load all the generated shaders without compiling. If no new shaders have been generated, then skyline will not save to the cache. New: End game: When exporting a game, skyline will now export the shader cache with the game in DX11. This enables the game to skip the shader generation and load scenes quicker with no stutters once the game has started. 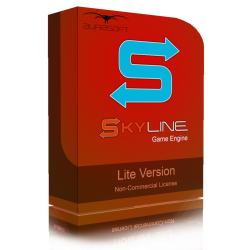 New: Lite Version: When new Lite version released, you will know about it inside skyline. New: Editor Plugins: Placing a *.ico or *.png of the same name as the main ui/lua file will set the icon in the main editor plugin menu. New: Editor Plugins can now be placed inside folders and skyline will automatically create the plugin menu to represent the folder structure, this makes it easier to manage and organise plugins. New: Editor Plugins: Adding a *.ico or *.png to the folder in the editor plugins WHICH IS NOT a plugin will give the submenu an icon. New: Editor Plugins: can now be encrypted to keep your UI, stylesheets, QRC and Lua scripts secure as you sell them on the store. Only images cannot be encrypted at the moment due to the way Qt and its QSS work and require hard coded paths. New: Editor Plugins: New Plugin menu action > Encrypt Plugin. This will automatically ark the necessary files for you. Not available on Lite versions. New: Editor Plugins: All the plugin examples have now been added to the Editor because they are stored in a plugin folder called "Example Plugins". New: Asset Manager: You can now batch convert all meshes in a folder and subfolder to reset the pivot of each one. Also displays on screen processing information. New: GO: Lights fake sapot light volume. New: Entity: Base property "NavMesh Include" with this you no need to be concerned about static/dynamic. If you want this object to be included in navmesh then set this option to true. New: Demo: Race Track, upgraded to gen2 materials and adjusted AI to be fair. New: Demo: Navmesh demo, simple click to make character move to new location. New: Videos are now supported in scenes. New: Video Manager Include Script added to "Asset Library\Scripts\Base Classes\System Base Classes\Video Manager" called SkyVideoManager.lua. This will help you get videos in quick and easy with no management. It handles both cutscenes and video textures on materials. Updated: Debug raycast lines to be less bright so as not to trigger bloom at lower levels. Updated: If skyline boots from a different location to the last time, then the asset library paths are compared, if they are different, it updates to the correct asset library. Updated: Editor Plugins: When refreshing the plugin list, it will now also remove plugins aswell as adding any new plugins that are found or deleted. Updated: When the player or end game loads for first time, it will choose the DX11 renderer instead now because of the extra performance. Updated: The Resource loading screen of the end game has been changed with the newer skyline logo and removed the flames. Updated: Removed downloadable players as it adds too much extra work, plus with the file size of end games being reduced, it is not too bad now. Updated: The default game manager script now calls a level with the tag of main automatically. 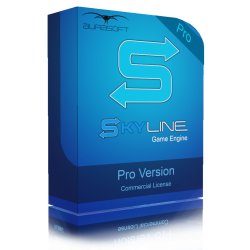 Updated: Studio Pro versions can now disable the skyline ident at the start of the game load. Other versions cannot use this feature. Updated: Lite Version: Only 1 main library can exist at once. Updated: Lite Version watermark shown all the time. Updated: Lite Version: Default lite version image has been updated for the logo. Updated: Lite Version: Updated many of the purchase skyline texts to give more information. Updated: Lite Version: You can now have 2 roads instead of 1 road per scene before the purchase box appears. Updated: Lite Version: Lite version splashscreen has been updated. Updated: Improved the scene update marginally where many sceneEntities are used as skyline was looking through a vector multiple times per frame. Fixed: Lua: Spawned lights automatically had shadows enabled for point lights, Considering the usages of point lights, this is now set to false and can be enabled from lua. Fixed: Lite Version: Loading a scene that has single navmesh which wont work in general due to limitations but then loading a tiled navmesh scene would crash the editor. Fixed: Vehicle rotations on first play were incorrect in the player and end game. This issue has been resolved and the vehicles now contain the correct position. Fixed: Editor Plugins: If you deleted a plugin, but then proceeded to using the plugin from the skyline plugin menu, it would crash the engine. Fixed: Resources could crash in end game if the resource group did not exist and polled for from the Global group. Fixed: End Game: There was a random crash on game startup which was caused by a video worker thread accessing an invalid array. Fixed: End Game: Videos were rendered twice per frame and then halfed on the timedelta, this was an error. Now timedelta is not halfed and video is rendered only once per frame. Fixed: When converting a texture to BC5, it would regenerate each time if the resource group was material but the texture actually existed. Fixed: Loading older gen1 scenes could have brought in a resource group name of blankstring which would then proceed to crash. Fixed: Resource System: When getting material names from a .skymat file; if it had an error and failed to parse, it would crash skyline. Fixed: ClickObject function was crashing if no target was detected. Fixed: If a road material did not exist when loading a scene, skyline would have crashed. Fixed: Editing an entity dyn props when in play the game and stopping while an entity was selected followed by moving the gizmo would lead to a crash. Fixed: Physx Stack would crash if the material was errored or didnt exist when it spawned the stack. Fixed: Updating: When getting the download location from the server, if the returned address had a line break, it would crash when generating the auto update. Fixed: Navmesh: Calling isDestinationReached without having a navmesh would crash. Fixed: Navmesh: Calling isDestinationReached() without setting a destination would crash. Fixed: Navmesh: When loading a scene that uses a single navmesh mode, the generated geometry would come in incorrectly. This was due to the fact that the scene had not been rendered yet so no extents or positions of navmesh entities were stored in the cache.. Fixed: Loading a scene with Tiled navmesh afte a scene that had single navmesh would crash as the entities the previous navmesh was generated with was not cleared off but the entities were. Fixed: Successive calls for rotating an object would lead to incorrect orientation and scaling due to floating point limitiations. Now the results are normalised. Fixed: End Game: When exporting the level, if a mesh did not exist in the resource group, it would crash on export. Fixed: Defragmentation could occur with skeletal animations where it crashes or the animations glitch or disappear if plenty of scenenodes are removed( >100 ). This could happen if unloading a large level. Fixed: Mesh Editor would not render if opened directly after loading skyline without loading a scene. Fixed: Mesh Editor would crash if it was opened, then load another scene due to the resources it was using being cleaned out. Now it resets to the default sphere in the editor to ensure stability.